Submitted by Sidhekin on September 5, 2011 - 3:27am. When you're shooting for recognizable (in general) or comprehensible (for comparisons specifically), you are likely to hit boring. Submitted by Lancer Jones LeRay on September 5, 2011 - 5:34am. Would you have spreadsheet (see a previous comic) that compares (many) of the most common comparisons? Submitted by Fuseblower on September 5, 2011 - 5:35am. 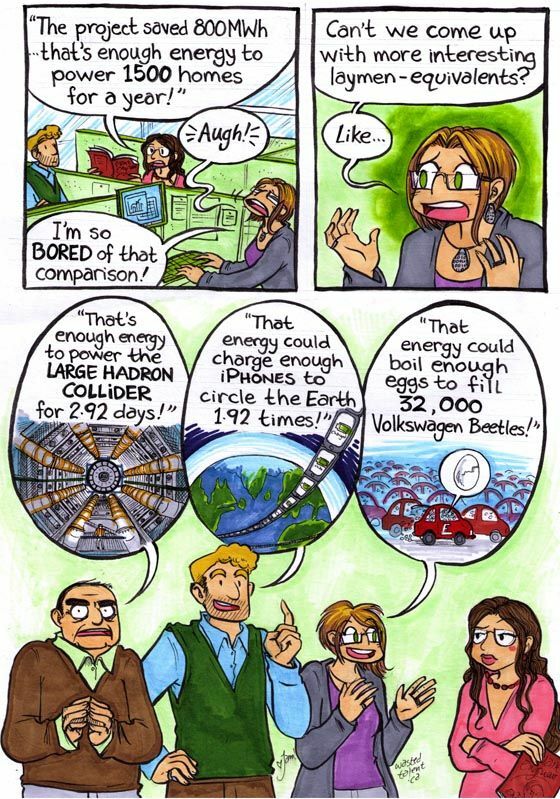 Interesting about the Large Hadron Collider. I did the same sum using 800MWh, only I used Libya's power consumption for 2006 - and came up with an identical answer. So this means that the Large Hadron Collider uses as much electricity as Libya uses - unless Libya's having a civil war, of course... just to find one measly Higgs Boson? Submitted by Ian M Topping on September 5, 2011 - 7:46am. Submitted by Iko on September 5, 2011 - 9:13am. That energy could charge enough car batteries to fill three and a half Olympic swimming pools! That much energy would be released by 685 tonnes of TNT exploding! That's not even nearly enough energy to boil Lake Michigan! I was disappointed. Submitted by Jam on September 5, 2011 - 9:55am. Submitted by Mark Penrice on September 5, 2011 - 10:36am. I might be doing my sums wrong here, but I'm pretty sure 800,000,000 watt-hours divided by (1500 homes x 365.25 days in a year x 24 hours per day) comes out as an average energy consumption of only 61 watts. My fairly modest fridge-freezer ALONE uses more than that. Never mind adding on the clock radio and cordless phone base station. Or, yknow, any other electrical load such as the lights, oven, power shower, computer, etc. How about, "it's enough to propel an electric car for 2.8 million miles at 70mph" (or 4.5 million km at 110km/h) ? Submitted by Jam on September 5, 2011 - 11:33am. Yeah, the full writeout is "800MWh/year with a 10 year persistence" so the total energy is 8GWh, that's what was used in the calculations. It's just a bit linguistically cumbersome, so I simplified it for the panel, but you're absolutely right. Submitted by Mark Penrice on September 7, 2011 - 1:46am. And if their average speed is a more realistic 35mph / 55km/h or so (at least, that's what my trip computer says*), the energy use is quartered... so we're back up to 1000. Which doesn't sound so impressive, but only because people have a highly distorted view of just HOW MUCH energy it takes to propel a motor vehicle. My electric shower is the highest consuming device in my apartment, and is run for maybe 10 minutes per day; its output is equal to that of my modest commuter bike, whose engine would be considered far too small and underpowered to propel any car made after about 1950. * ignoring the fact that the displayed average fuel economy for these trips is no better than about 7/8ths that of travelling at a constant 70 (110 :p), and I have to cruise at about 85 (135) to match it... Perhaps an electric wouldn't do so badly because it misses out on some of the delicious inefficiencies of using low gears with a reciprocating engine that has lots of belt-driven accessories, and of using friction brakes for the vast majority of kinetic energy dissipation. Submitted by kendrakirai on September 5, 2011 - 2:34pm. It's actually a biological/psychological/conceptual reason for breaking things down into more easily understood chunks. The human brain has trouble concieving of very large numbers or abstract ideas. More than a few miles, and our brains stop thinking of it as 'distance' and start thinking of it as 'travel time', because that's something we're more cognizant of...our brains understand time better than they understand distances greater than walking distance. A number like 800 MWh has no meaning to the vast majority of people, so we need something that we can rationalize...powering a house for a year for example. It's the same with large sums of money. The go-to equivalents from my experience is how many hamburgers, or luxury cars something equals. Submitted by Mark Penrice on September 7, 2011 - 3:57am. Can run a 2 bar electric heater continuously for 45 years? Equivalent to the entire electrical consumption of an average human for their entire life? Generates £9,600 worth of electricity per year? Submitted by Mark Penrice on September 7, 2011 - 3:59am. In other news, this means the LHC chows £32,875 PER DAY in electrical costs. How's THAT for a statistic? Submitted by John Edward Casteele on September 6, 2011 - 12:51am. Submitted by Mark Penrice on September 7, 2011 - 3:52am. I'm amazed they didn't freak that some of their readers wouldn't know what a website is ... i know a few people (mostly elderly - not stereotyping, it's the truth) who still have no idea about any internet/home computer stuff, 15 years after the popularisation of one of those things and 25 after the other... Can barely even operate a mobile phone (or, not at all, and have trouble with cordless) and text messages are a closed book. Not senile, have no trouble living their everyday lives otherwise, just... deeply ignorant of this other world that exists unseen around them. Zero frame of reference for understanding anything like that. Online Auctions? What? Like, on a train? Submitted by John Edward Casteele on September 8, 2011 - 10:47pm. I once had an article for a website sent back because I gave the instruction to remove the two screws on the back of a computer case that hold the side panel in place. The rewrite instructions said that I needed to specify WHERE the screws were located and HOW to remove them. Submitted by Mark Penrice on September 13, 2011 - 2:15am. Oh god... that's surely the "if you can't figure this bit out for yourself, maybe you shouldn't be messing with electronics" moment? Submitted by Bruceski on September 6, 2011 - 1:23am. "That's half the energy of the Hiroshima bomb!" Submitted by Pierre Lebeaupin on September 6, 2011 - 4:22am. The reason "olympic-sized swimming pools" gets used is the same as "Hiroshima explosions" is: it's something people have heard of enough that they believe they have the faintest idea of the amounts involved. The Register has a nice standard of unusual units ( http://www.theregister.co.uk/2007/08/24/vulture_central_standards/ ) along with a converter ( http://www.theregister.co.uk/Design/page/reg-standards-converter.html ), though they unfortunately do not have energy or power. That being said, we can always use megaNorris-Brontosaurus or kiloNorris-sheep in a vaccum for those respectively. Submitted by Brittanic on September 8, 2011 - 8:45am. I second the use of the Reg standard units and recommend that a liaison between you and them to develop energy comparisons. Submitted by Steeltoe on September 12, 2011 - 1:37am. The weirdest measurment I ran into was Wheelbarrow-fulls per hour. Submitted by Mark Penrice on September 13, 2011 - 2:22am. Not sure why you'd bother with a 1/3" blade when you could have 5/16" or 11/32", or even 8, 8.5, 9mm... but there must be a reason. Maybe it's on the basis of making a particular number of blades / tools out of an inch (foot, yard) of material, and the actual size it came out wasn't massively important. Might even be originally 11/32" but with a certain amount of wastage built in. After all I've come across slightly gouged out allen bolts where i was wishing for a half-mil (or X/32") size that didn't actually exist, maybe that thing is to bridge the gap with a worn [name of object to be worked on] which started life as 5/16" but hasn't quite reached 11/32" yet, has pretty fine tolerances, and needs a lot of force put on it. Submitted by Mark Penrice on September 13, 2011 - 2:27am. Huh, whilst we're on it... web ads are getting smarter. One at the bottom of the page right now is for "the economy radiator" which offers "affordable electric heating (as cheap to run as gas)"
I've clicked thru for more details. I'm intrigued to hear how they've somehow managed to make electric heat somewhere between 2 and 4 times more efficient than the standard issue. The only thing I can think of is that they're going to compare heating one room with an electric radiator (like the little 500w radiator in my compact'n'bijou bedroom) vs heating the whole house with a gas hot water / warm air system (like the 3kw+ system that heats most of the apartment all at once). But in any case, that's another layman-unit comparison. No hard figures, no costs, just "as X as Y". Submitted by Mark Penrice on September 13, 2011 - 3:08am. Hmm. Apparently my follow-up to that is triggering the spam filter. Who might I be able to send this to in order to have the offending parts excised or re-written? My previous experience with such things is it could be an otherwise totally innocuous word or group of them (I think I've set one off with "simply" before, or other such common scrabble words) and I could spend a couple hours rejigging it without success. In any case, just cast your eye over economy-radiators (dot com) and let your mind boggle (the "how it works" page is particularly horrific, the electricity tariffs one no better, nor the pdf brochure that claims heating the "gel pack" with 250w somehow wastes less money than doing it with 1000w... someone dispatch a physics teacher, stat!). Particularly if you hit the Free Quote page and look at the prices. Jesus H... Thing is, I half expect to find my grandmother conned into installing a bunch of them next time I go visit. How do people get away with this? Submitted by Mark Penrice on September 13, 2011 - 3:19am. "Once you have stored the heat, unfortunately you cannot stop it coming out, or conversely they do tend to run out of heat in the evening just when you need it most." The firestone inside is heavily insulated, and the controls on it open vents that let cold air from the room flow in and be heated by the stone. If the heat's run out, either you need a more powerful one installed, or need to be more careful about how you set the thermostat and timer. If the thing's set to be at full heat all the time, and it's only specced to be run at half duty, of course it'll run cold. If it's been properly specced and installed, it should still have some residual warmth by the time you hit the off-peak period again, therefore not actually needing as much power to come back up to temperature. (Or, more precisely: It will likely use more power overall, but a much greater proportion - hopefully, all of it! - will be off-peak, rather than needing an expensive peak-time boost). Plus if you're on Economy 10 rather than 7 - though this company slates both of them equally - there's an additional midafternoon off-peak period (covering the time when kids are at school, housewives are out shopping, the sun is shining and the air is warm, lights are off, etc) where someone who's paying any kind of attention can set a lower-spec storage heater to rewarm, and/or the hot water immersion coil to reheat the tank. This is, in fact, exactly what it's designed for. "The heat given off by a storage heater is a dry heat, the air is actually physically burnt hence the carbon deposits, this is extremely bad for your health and incredibly hazardous for asthma sufferers." Words cannot describe the sheer amount of WTF I am getting off this. Hopefully I need not to point out to anyone reading WT what's wrong with that run-on sentence. Submitted by fluidlyunsure on September 18, 2011 - 3:56am. Excuse me Mark, but your ideas of the elderly are not true. My 70+ mother for example makes money as a network marketer. Being 50+ I'm a PHP freelance programmer and I'm starting a web development company. Until I moved out of the area, I was one of the youngest member of the oldest computer club in America. The membership included engineers swapping stories of robot wars back in the 60s, to retired women who want to keep-up with the latest trends so they can communicate with their great grand-children. Changes do happen with time but many of us haven't stopped keeping up yet. In the 55+ community I live in every wifi network is secured. That wasn't true when I lived in an area filled with a bunch of twenty or thirty-something kiddies. It wasn't long ago that the biggest growing community in FB was over 45. I don't know the numbers now. My experience is that the 45+ crowd does tend to communicate more with email than SMS, and they are most are more concerned about the privacy issues on FB. However, they aren't ignorant. In fact, they just might be wise. Only time will tell which technology will win in the long term and which is just plain silly. I wonder how old you will be then. Finally, I don't expect to battle senility for another 40 years and shouldn't be written-off until then. But who knows what advances will happen in that time? Being young is exciting, but it is only part of life. I've always thought laymen conversions were quite strange. The home-year is actually a pretty decent comparison (albeit boring) but over the years I've come across some really crazy ones. I don't understand why writers think that science will be easier to grasp if they just convert the volume to olympic-size-swimming-pools equivalents, etc.